Mecalux has installed different storage and picking systems in the new warehouse Petz owns in São Paulo (Brazil).With this combination of solutions, the company dedicated to the supply of pet food and accessories has increased storage capacity and streamlined the order preparation process. Petz, founded in 2002 by Sergio Zimerman under the name Pet Center Marginal, is one of the most recognised Brazilian companies in the pet care market. Its 49 shops in cities like São Paulo, Rio de Janeiro, Minas Gerais or Goiás are proof enough. Each shop carries more than 20,000 pet care items, including food, accessories and toys, as well as veterinary medicinal products. Petz has experienced strong growth in recent years with the opening of seven new shops in Brazil in 2015 and twelve more planned for 2020.In a short time, this growth has positioned it among the five most prominent companies of that segment worldwide. To supply all of its shops, Petz needed a warehouse capable of managing the large quantity of goods it handles and that would facilitate its picking operations. The company works with different sized products and those that require special handling. As a result, a particular storage solution was needed for each type of product. On the other hand, the company also needed a space set aside to install new storage systems as required. With all of these factors in mind, Petz chose Mecalux to supply them with the right storage systems and provide a highly competitive warehouse that would allow them to remain a benchmark brand in pet care. In a 10,550 m2 space, different storage systems have been installed where a certain type of product is kept, and a specific operation is also carried out. The solutions implemented to meet the requirements of Petz have prioritised picking agility over storage capacity. This system –known for its versatility and adaptability to any type of load, weight and volume– is suitable when storing pallets of different SKUs and consumer goods such as those Petz distributes. At the same time, the racks offer direct access, which helps to streamline storage work in a good way, while providing excellent stock control. 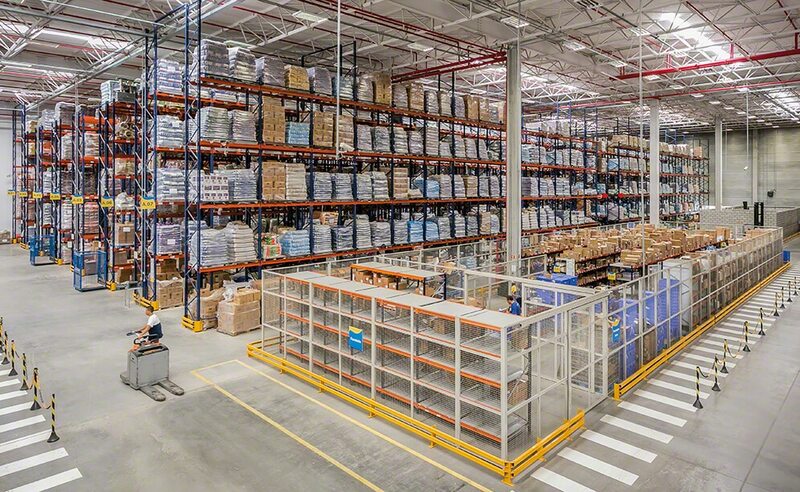 Operators place and remove goods from the racks with the help of reach trucks that work in a 3 m wide aisle and are capable of reaching the top level. As a safety measure, the racking uprights have been protected to absorb possible impacts produced by the equipment during handling of the unit loads. Most racks have five load levels, although the lower level of some has been divided to store smaller product and optimise space. The bottom levels have been set up for picking to be done directly from the pallets, leaving the palletised reserve stock on the higher levels. To carry out picking, operators work with ground level and high reaching order picking machines. Ground level order pickers deal with items located on the first level of the racks or the ground floor, while high reaching order pickers facilitate access to the goods deposited on the upper levels. There is a transversal aisle enabled in the central area that crosses the storage aisles, facilitating the flow between the different zones in this area. The width of this aisle enables the circulation of two handling machines at the same time. Beside the pallet racks, a medium- and heavy-duty racking area has been provided, designed for the picking of the most sensitive products and those that need to be protected and insulated. This zone consists of three aisles with four-level high metal shelves and two five-level shelving units installed at one end. Two beams form these flat surfaces with shelves wedged between them, which ensure heavy-duty shelf performance. At the opposite end of the loading docks, a mezzanine has been built to perform picking tasks right above the pallet racking. This set of racks, with a capacity for 1,446 pallets of 1,000 x 1,200 mm and a maximum weight of 1,000 kg each, creates ten aisles where lower consumption products are stored. The mezzanine occupies a 1,447 m2 area and, just like the sensitive product zone, there are medium- and heavy-duty racks with shelves. Throughout the 18 aisles, smaller products are picked, such as accessories and components. In the mezzanine, an access ladder for the operators also functions as an emergency exit. On the other hand, three hinged safety doors create a loading and unloading area for palletised goods that are handled by forklifts. One of them has been allocated to incoming pallets and the other two for outgoing ones. In addition, the safety of the mezzanine is rounded out by rails placed to protect open areas. Orders are moved to the consolidation area, where the packaging, labelling and issuing of the required shipping documentation take place. Bearing the needs of Petz in mind, and due to the large number of orders put together daily, 24 stations were enabled to prepare and consolidate orders, as well as three fully automated scales, sealers and labelling machines. Each station is also equipped with the necessary computer equipment and printers to complete the operation. Next to the consolidation zone, a block of drive-in racks has been arranged to store consumer goods. This 8.5 m high block consists of three or four levels (depending on the merchandise) where pallets can be deposited six deep, holding a total of 408 pallets. The preload area is located in front of the 16 loading docks in the Petz warehouse. Pallets are grouped on the floor depending on the correlative order or transport route. Orders are fully prepared before the lorry is loaded, this way wait times are cut for goods leaving the warehouse. Optimal logistics care: the available space is used intelligently, taking advantage of every square metre with efficient operations that contribute to top installation throughput. Diversification: the distinct solutions allow the storage of a great variety of products of differing sizes and weights. Cost effectiveness: the Petz warehouse is a model of profitability and efficiency that will help the company manage its continuous growth in a flexible way.